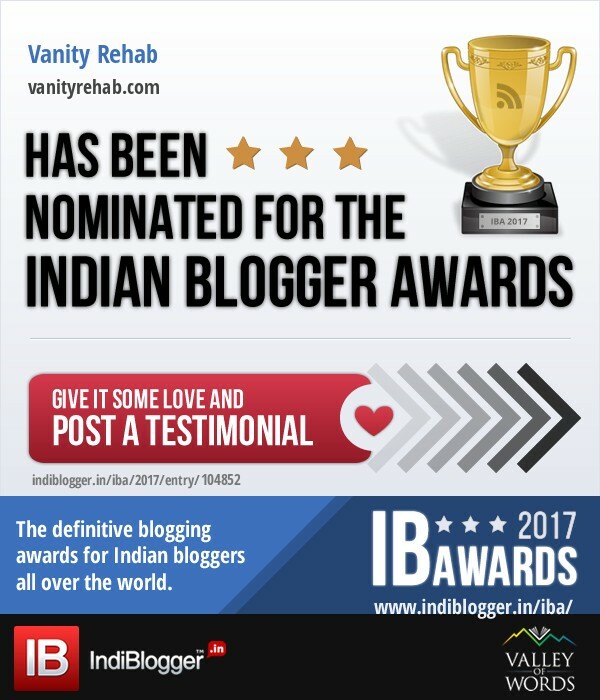 Vanity Rehab: Nominated for #IBA2017 The Indian Blogger Awards 2017 - Indiblogger. Please Support! Nominated for #IBA2017 The Indian Blogger Awards 2017 - Indiblogger. Please Support! 2. Beauty and Personal care. 4. Improving Quality of Life in India. The Jury for the #IBA2017 has been Announced Today and i must say, it is quite impressive! Many Prominent persons like Gul panag, A Major from Indian Army, Amit Agarwal, Preeti shenoy, Rashmi bansal and 23 more are a part of this jury. You can have a look at the full list HERE.